I know, what you’re thinking, why does annihilation have two ‘n’s? I haven’t time to explore that phenomenon, but let’s look at the life saving properties of the laughter snort. You’ve heard of people being in a ‘fit’ of laughter, and also that laughter is ‘contagious’, right? So basically laughter is a fit that’s contagious. When a small bout of laughter is not quickly squelched, others within hearing distance are drawn in to see what all the mirth is about and they too catch this fit. And from here, more and more people irresistibly join the laughter. At this point the funny virus grows exponentially in size and intensity. But the human body can only increase in laughter so much until it will start to implode into itself – just like a black hole in space. Signs of your approach towards a hilarious doom include tears, aching stomach, the need to change underwear, and ultimately the snort. 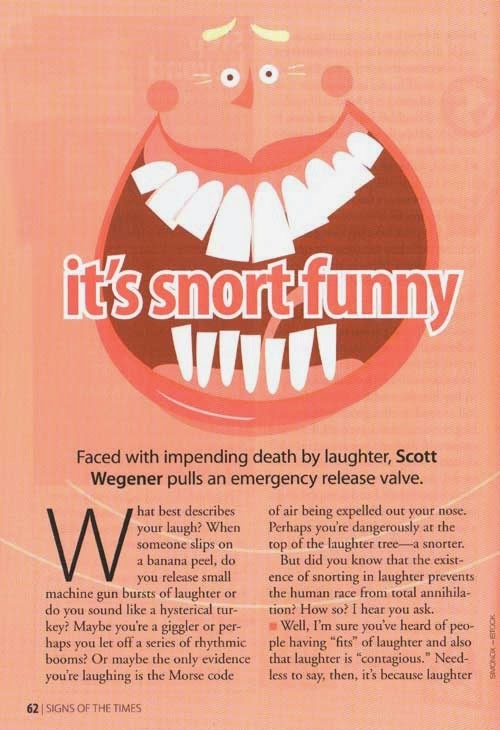 Fortunately we humans, the only ones infected with this cackling condition, have a built in safety valve to prevent laughter black holes from forming - the safety snort. It works like this: when a person begins to approach the critical point of laughter, a snort, or ‘Sus scrofa release’ as the scientists refer to it, releases pressure. Everyone will snort when they reach this critical point of no sombre return. Some never reach this critical point, others max out their threshold very quickly and will snort instantly when faced with mirth. So you see, laughter is NOT the best medicine. It’s a highly dangerous body function that should be taken seriously. If you see someone in a fit of laughter, how can you help? Block your ears, approach them slowly and encourage them to release the pressure by chanting “Snort! Snort! Snort!”. If their nose is blocked, and they can’t snort, give them class of milk while they’re laughing to help clear their nasal passages - just have some tissues handy. But thankfully it’s prophesied that change is on its way. But until then... just keep on snorting! *I re-read this article after I wrote it. Yeah, I think THAT’S where I saw this amazing ‘fact’!